Amongst the most striking of the findings during the Mursiland Heritage Project is a range of megalithic architectural forms. These are found in clusters at differing locations across the Dirikoro region, and architectural types appear to be distinct to particular areas. 25 partially buried stone platforms have been cleared and recorded, and up until 2012 these have been the main focus of strategic excavation. Mursi refer to these platforms as benna kulugto, which translates into “stone circles”. They are visually enigmatic, comprising of multiple concentric rings of carefully laid stones most likely imported from outside of the immediate environs. These rings are interrupted by a gulley inset with a line of larger sub-rounded stones, and irrespective of where each platform is positioned within the landscape the gulley is oriented to the northwest. The size of the platforms generally varies in diameter between 2m and 11m, but the largest that has been found so far is an impressive 26m diameter. This was found within a tight cluster of at least 9 platforms that were aligned in a series at the north tip of the Arichukgirong landfall. Excavation has shown that deposits of fragmentary and part-articulated cattle bone lie between the stones at the centre of many of the platforms, along with occasional lithic debitage and high chemical values illustrative of other organic, perhaps fluid, deposition. 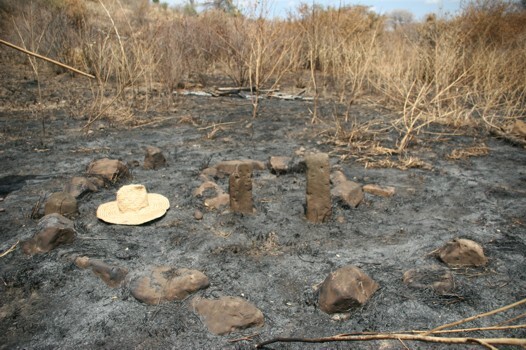 Current interpretation is that these are connected with animal sacrifice – an important practice carried out in Mursiland and neighbouring regions today during particular occasions such as initiation, war, ill-health and drought. Radiocarbon dating of bone from one of the platforms positions its use within the mid-18th century AD. This is a significant date for it broadly aligns with oral histories of an early 19th century mass-migration of Mursi into their current territory, thereby (according to oral tradition) forcing the displacement of inhabitant communities (ancestors of today’s Bodi group who now live in land to the north). This date also corresponds with local and more regional data for a climatic change from generally wetter to dryer conditions. This too is expressed in Bodi oral histories in which forced displacement is substituted by a population exit to the north in search of better grasslands. More dates are required to gain greater clarity of chronology and sequence. Questions we are hoping to answer include: Does the evidence from the platforms and the oral histories compliment one another? Were the platforms a part of a long-term cultural practice, or was their construction instigated within a condensed space of time in response to external pressures? 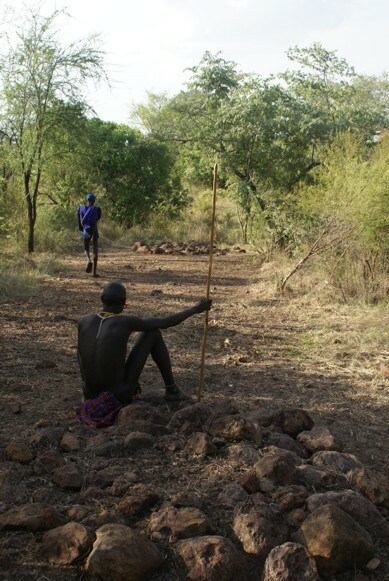 And, when did the practice of platform construction begin, and did it end or is it still a part of life in the Lower Omo Valley, albeit in a different form? Along the eastern landfall of the Arichukgirong, and within the broader grouping of stone platforms, are a number of stone cairns. These are about 3m diameter and differ to the platforms in that they are formed by a ring of large stone blocks encircling a rubble fill of variously sized stones. These are found either as pairs or in relative isolation, but all hugging the lower slopes of the Arichukgirong hill. Excavation is planned for future fieldwork seasons to ascertain the date and purpose of these cairns and their relationship to the platforms. 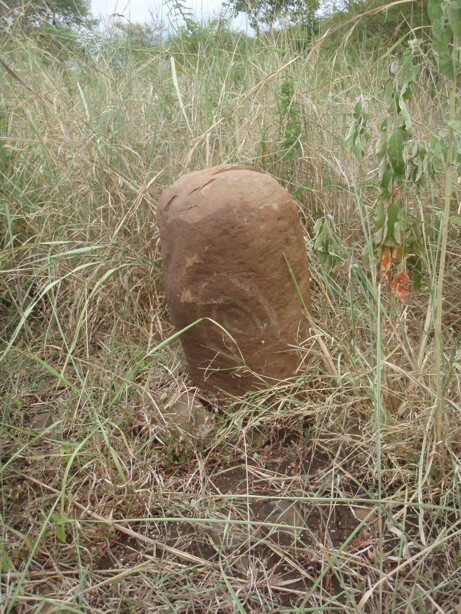 A range of other megalithic forms may be found across Mursiland. These vary considerably in character, but include enclosing circles of stone blocks between 2m and 30m diameter, upright stelae, and a combination of the two. The two examples illustrated here give a sense of this variation. 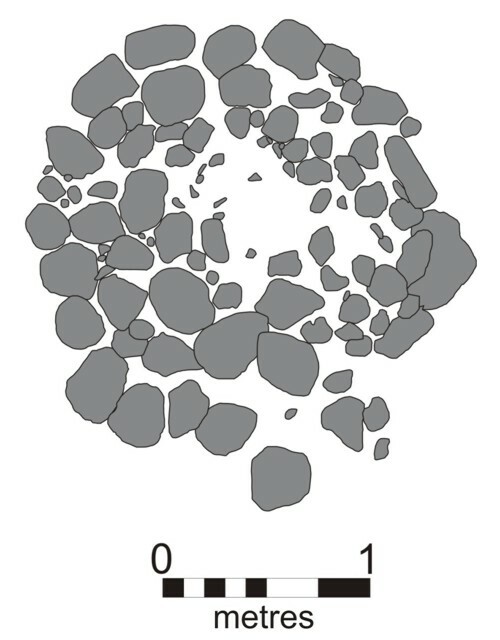 On the left is a small double (inner and outer) ring of stones placed upon a relict ground surface with a causeway the inner of which is flanked by two upright stones. The selection of stones is perhaps of some importance here, particularly for the upright stones which are likely to have been brought to the site from a waterbed. Excavation is planned for future seasons to test when and how these locations were used. During the project we have witnessed Mursi using circular arrangements of stones for a range of ceremonial practices, and the comparison of these with archaeological contexts could produce interesting results concerning continuities of practice. On the left is another megalithic site in which a cylindrical stone has been set upright and held in place with a wedge of smaller supporting stones around its base. The stone has been decorated on each face with concentric rings of white pigment. This is a decorative form ubiquitous in Mursiland, imprinted onto the bodies of both cattle and people, and various material items. This stelae is perhaps of more recent origin, but it is an interesting practice that also deserves greater understanding.